Another list of this season's short anime. A story about a kid with his seal having kiddie fun and being childish, I guess. It's definitely something to watch in-between anime. Specially if you decide to have a full-on marathon of heavy plot anime, and wants something to blow of some steam in-between... 5 episodes. Each episode has its own thing and theme to go with, and it's pretty much a fun anime. 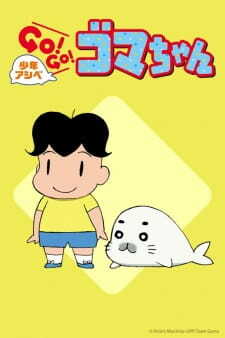 The characters are pretty lovable, specially Goma-chan and Ashibe. The other minor character does follows with both the main character. To be honest, that's basically it, the character is there to amuse you, in a way. The story is basically different in each episode. No big plot at all. Which is to be expect since it's really a short and comedic, and I guess the main audience are kids or weirdos like me who just wants to have some laughs. Art style kind of reminds me of "Crayon Shin-chan" with it's simplicity and overall art-style. And yes, the art style does fit with the overall anime, which is neat. If you want a short and funny anime, or something to accompany your binge-watch and marathon an anime, this is basically your go-to anime.